I often talk about how Morgantown is a college town, and I, being outside of a typical college-aged student, feel out of place. Most of the events cater to this crowd, as do many of the restaurants. 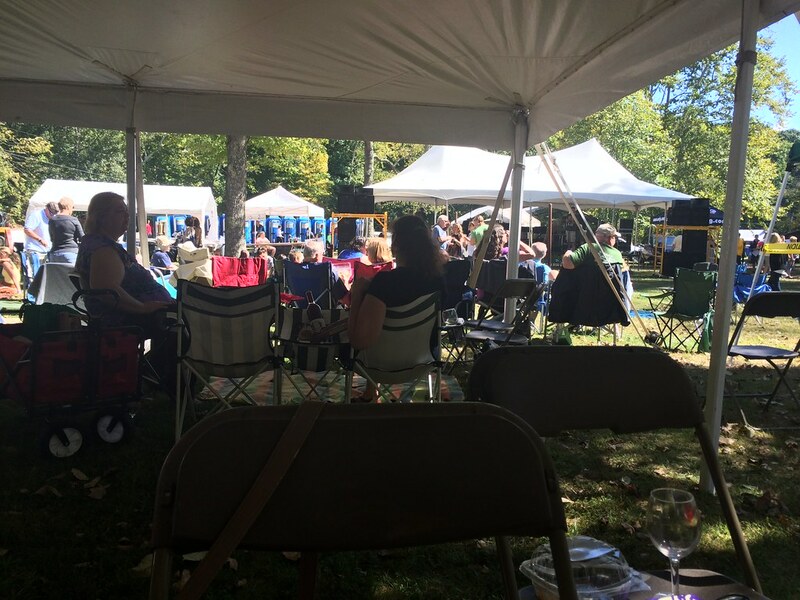 My absolute favorite event every year, though, is the West Virginia Wine and Jazz festival. It's the perfect time to revisit staple West Virginia wineries and possibly find some new favorites. 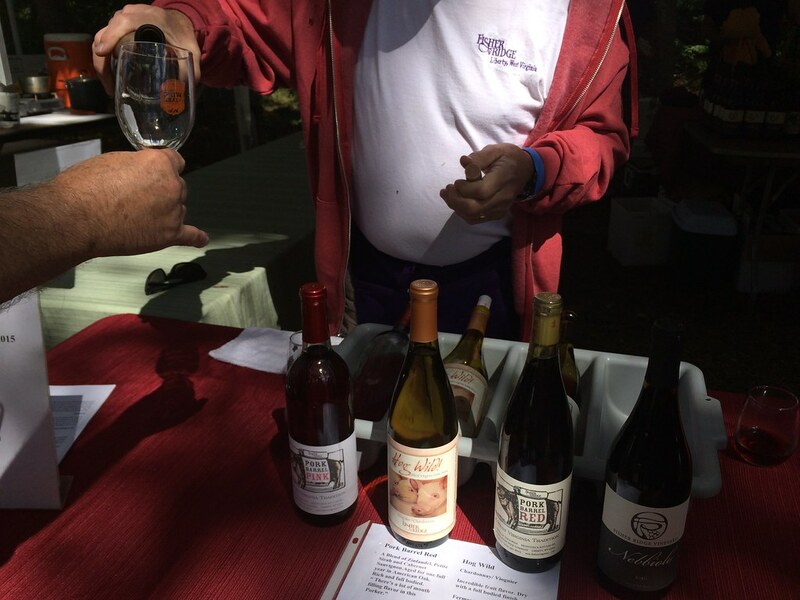 This year's event, which took place Sept. 19-20, featured Daniel Vineyards, Fisher Ridge, Forks of Cheat, Heston Farm Winery, Kenco Farms, Lambert's Vintage Wines, Potomac Highland Winery and West-Whitehill Winery. I've been to about half, and I hope to get to the other half as time allows. 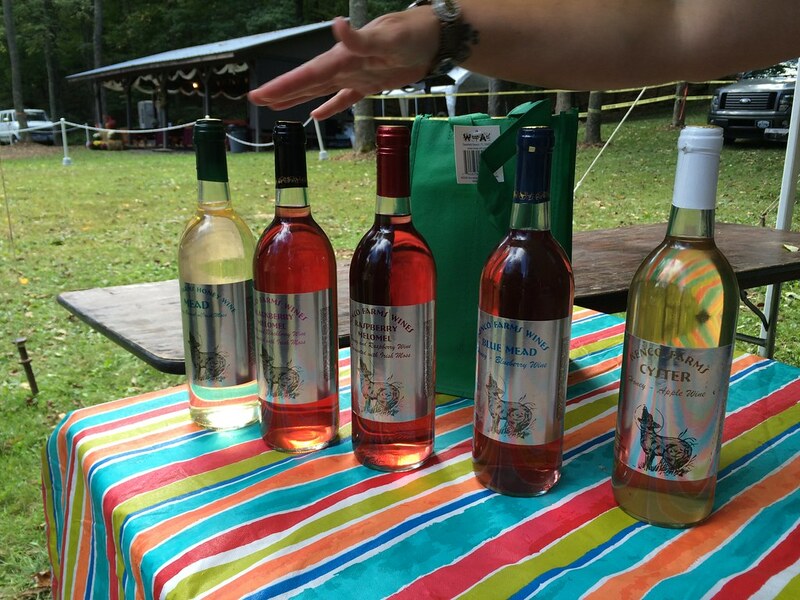 Some of my favorites are always Forks of Cheat, and I loved most Potomac Highland's wines, too. Food vendors included Chico's Fat, The Cupcakerie, Garcia's Latin Market, The Greeks, Jersey's Subs, Lamberts Catering, Ramada Inn, Russ' Ribs and Slight Indulgence (who had a killer wine accompaniment with cheese and more). 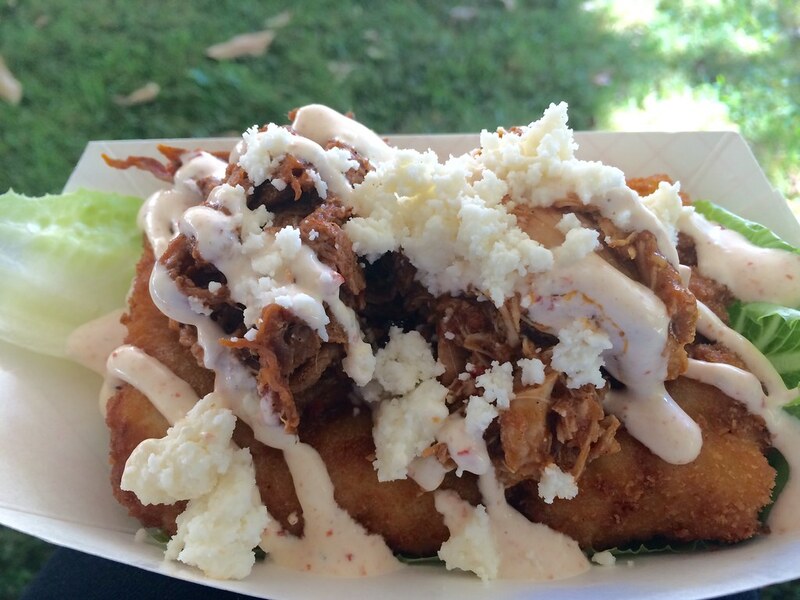 I ordered the "Almost Heaven" from Chico's Fat, which had ... get ready for it ... two deep-fried macaroni and cheese planks topped with pulled chicken and pork with a chipotle cream sauce and cojita cheese. So, really, there's very little you could do to make this NOT taste good. 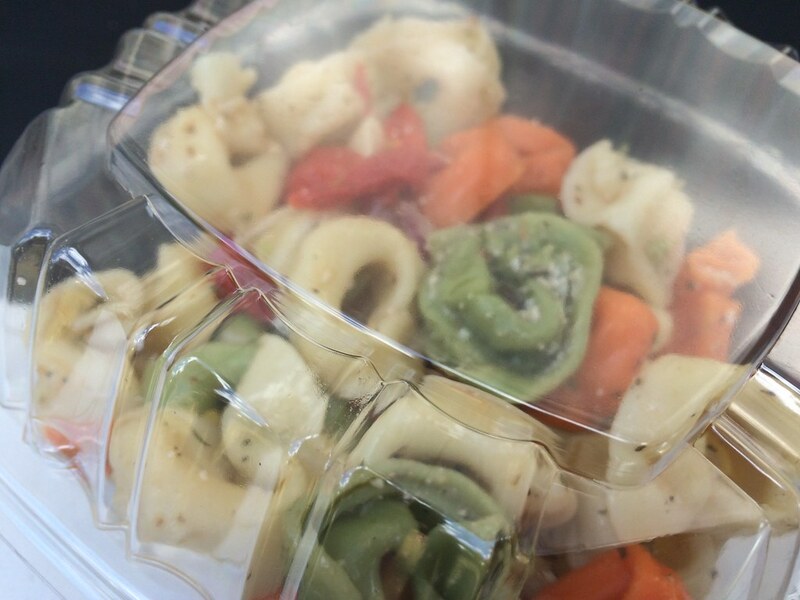 I also had a side of tortelini pasta salad from Jersey's, which was eh. So, who went this year? What were your favorite wines? 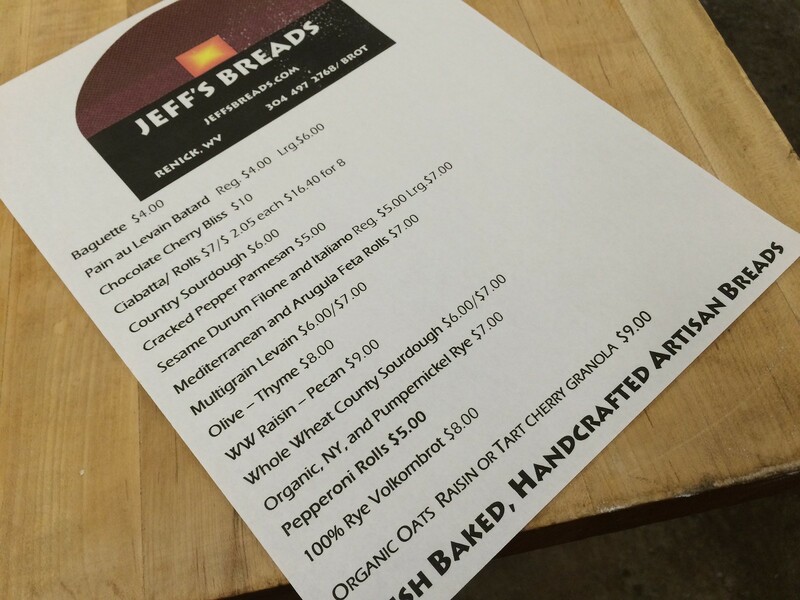 I've heard the name "Jeff's Breads" tossed around in Lewisburg for a bit. 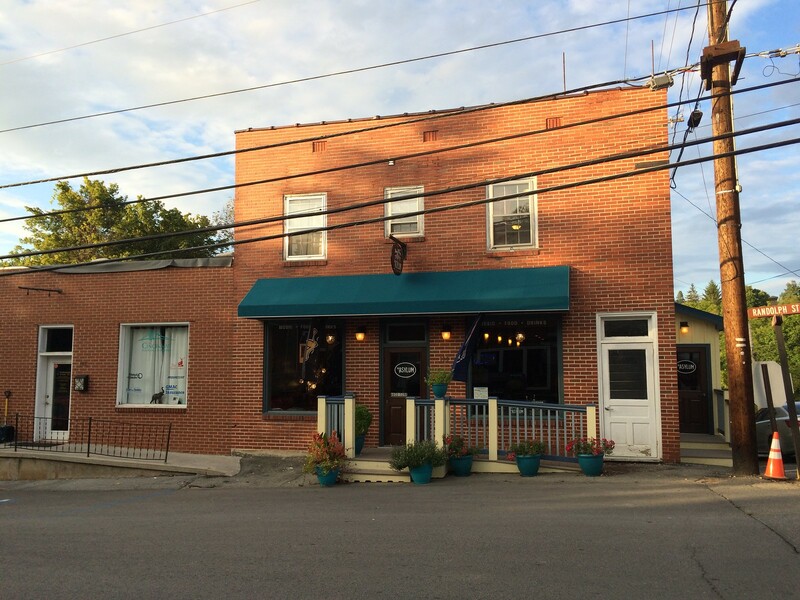 I remember first hearing about Jeff's Breads when I visited the Stardust Cafe in Lewisburg; some of their bread was from Jeff's. The Food Guy wrote about Jeff's Breads. 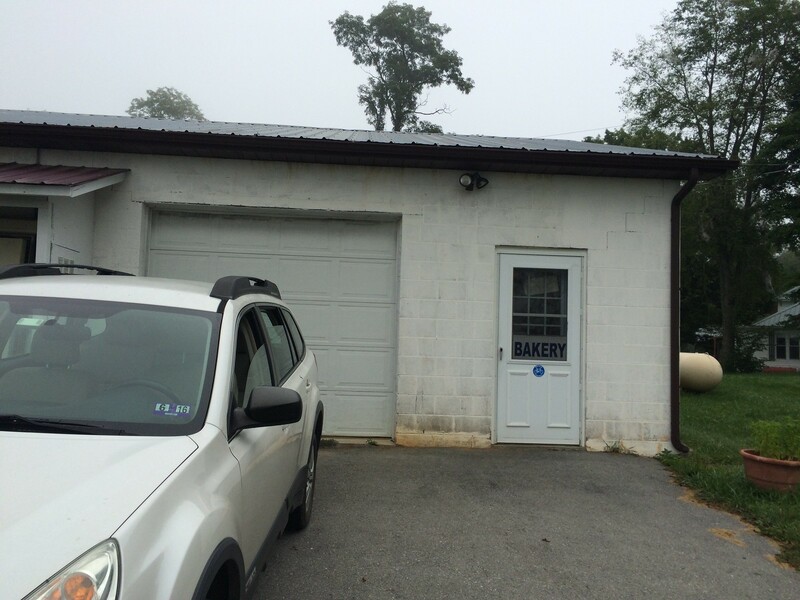 And I saw something about Jeff's Breads again when I had breakfast at The Bakery in Lewisburg. 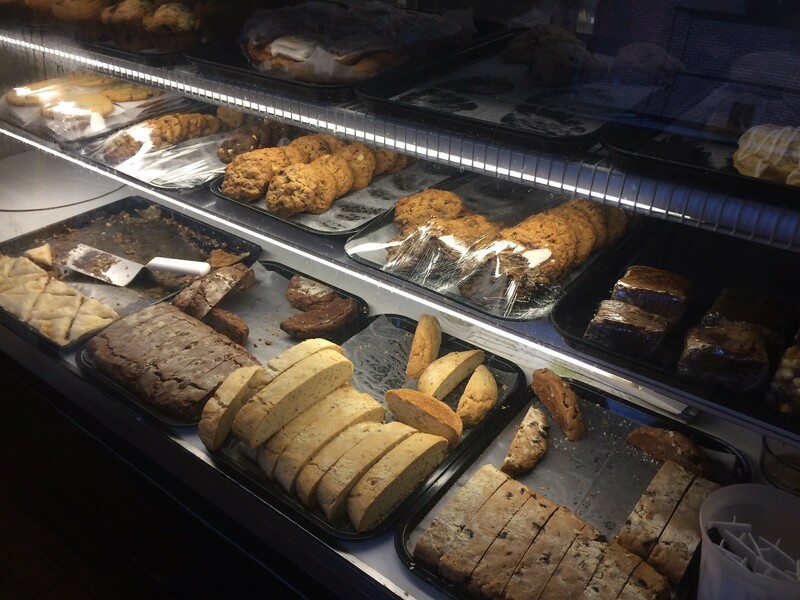 This local bakery, located just about 20 minutes north of Lewisburg, clearly has a strong connection to the Lewisburg community. 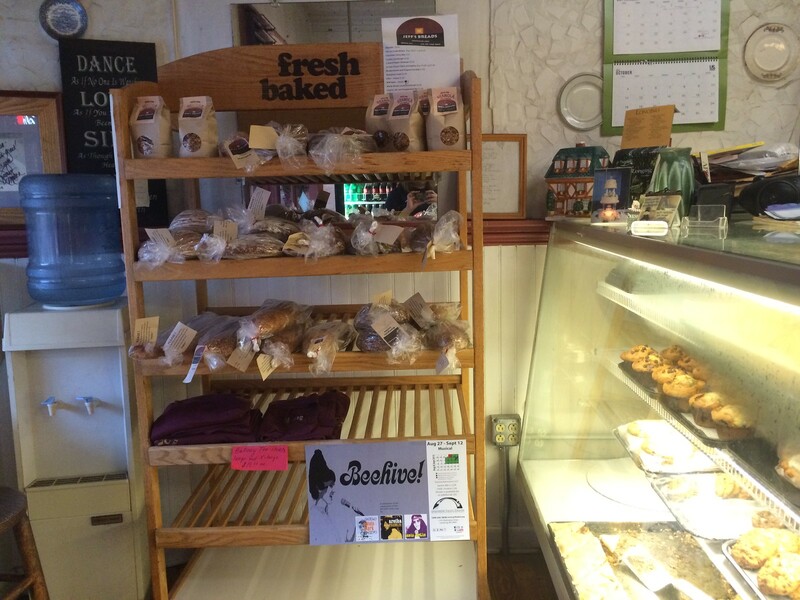 Jeff's Breads, located in Renick, offers European-style breads. The website says they open at 9 a.m. Monday through Saturday and to go early for the best selection. So, I put the address in my GPS (218 Crane Road, Renick, WV) and went on my way. My GPS essentially led me to a house. I pulled up into the driveway, looking for any sign of a bakery. Then, I looked to the right and saw a white building (garage?). I crept toward it and finally noticed a small sign in the window that said "bakery." Whew. There really isn't any name of the bakery or hours listed anywhere. So even if there was this random sign outside that said bakery, I was half concerned I would be opening a door into someone's home. 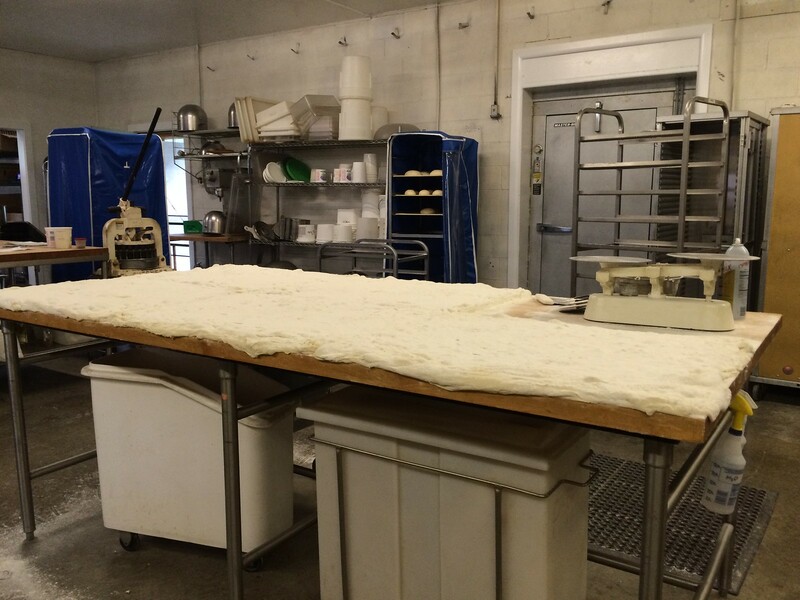 It doesn't look like much, but as soon as I walked in, I could see an entire table full of dough waiting to be prepped. There's no waiting area; you step right into the bakery. 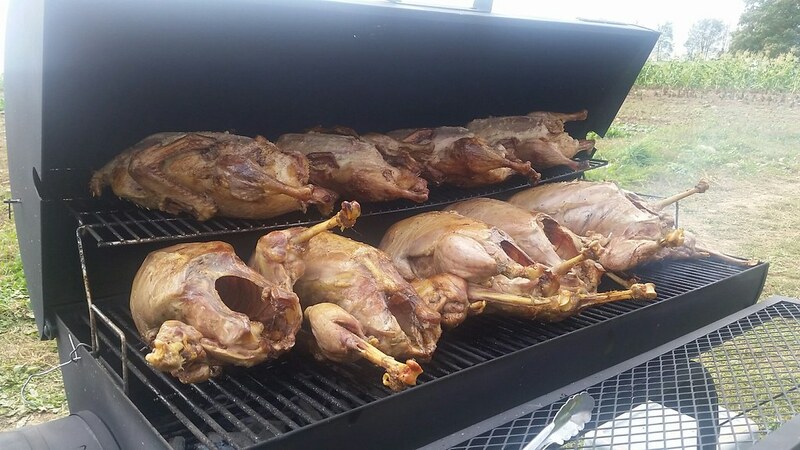 It smelled great, and Jeff came out from the back to greet me eagerly. My look of awkwardness probably gave it away that I was not a regular and indeed would like to see a menu. Jeff offers a number of beautiful breads, and I wanted to take them all home. Unfortunately, I still had another day left in Lewisburg, so I just needed some snacks, really. I asked for a pepperoni roll ($5) and a Mediterranean and Arugula Feta Roll ($7). Yum! 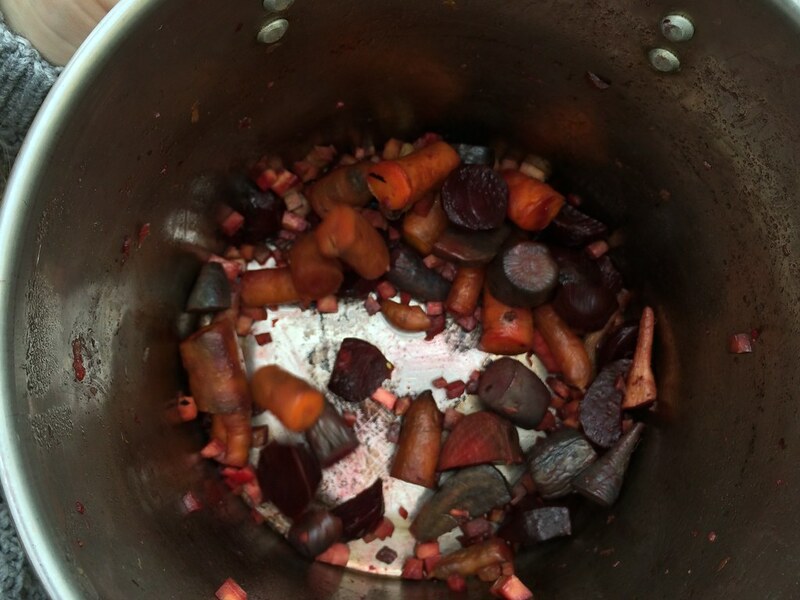 They were actually frozen, so I couldn't eat them right away. But I paid (cash!) and headed toward the WV State Fair for the day. I set the rolls on my dashboard to thaw. When I came back in a few hours, I had two snacks! 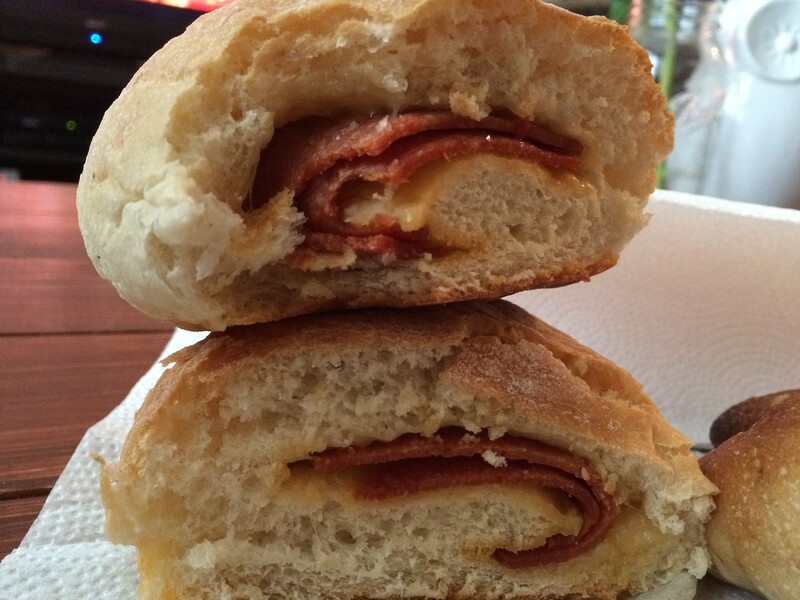 Let's start with the pepperoni roll. Fluffy, with a perfect golden brown crust on the outside. 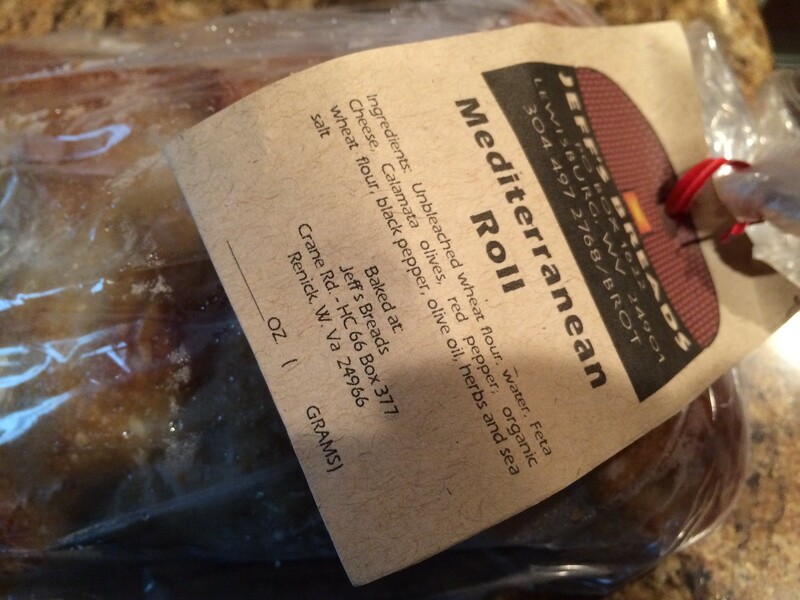 The Mediterranean Roll, though, is something I would travel again for. LOOK AT IT. 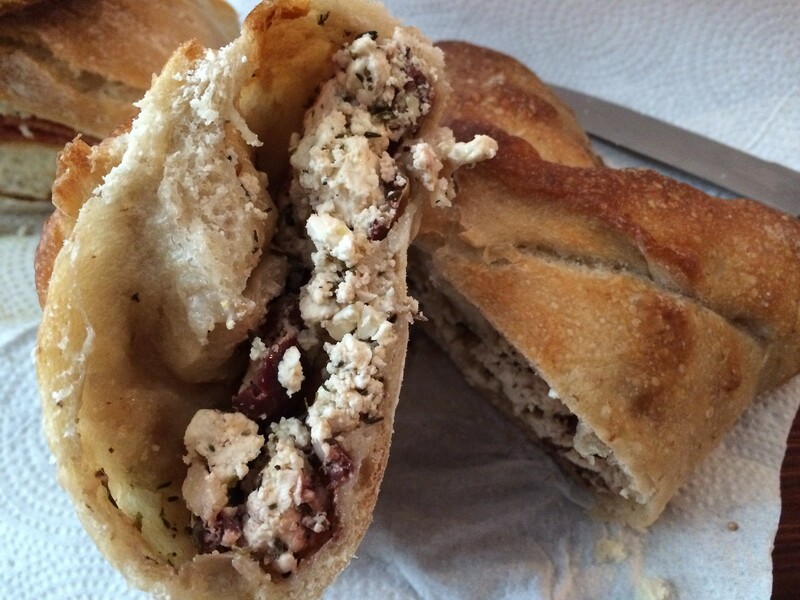 It's FULL of feta, arugula, olives. 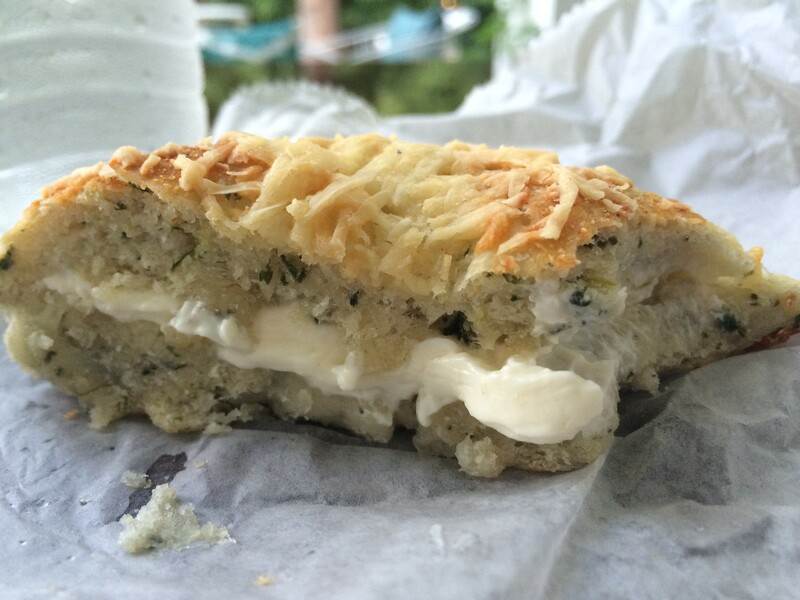 Dear god, it was savory and buttery and incredible. It reminds me of what I used to be able to get from New Day Bakery. I love these rolls. My only regret is that I didn't get more of them. For more information, call Jeff's Breads at 304-497-2768. Chef Ohlinger, the former chef/owner of Richwood Grill, hosted his fourth dinner in the 2015 Appalachian Global Dinner Series on Sunday, Sept. 27. 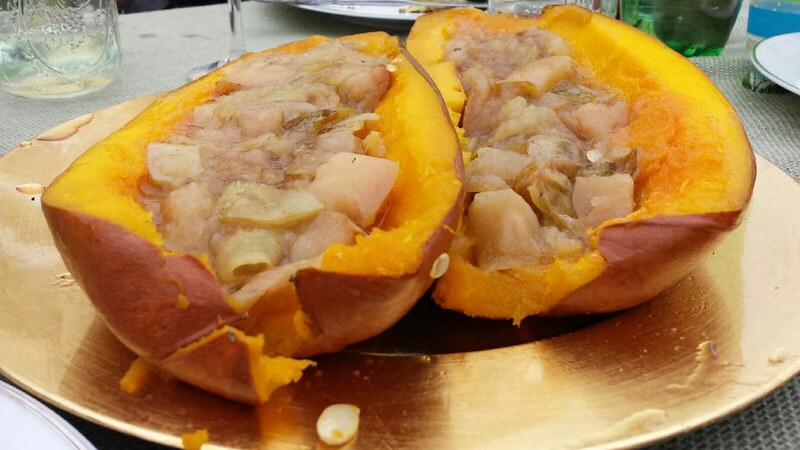 The goal of the Appalachian Global Dinner Series is to highlight the role of Appalachian cuisine in global culture, and to bring West Virginia recognition as a culinary destination, as per the website. Chef Ohlinger would combine dishes he's learned through his travels with an Appalachian twist during the inventive dinners at Richwood Grill and while he's searching for his next permanent location, he is completing this year's dinner series in a host of guest kitchens in the area. 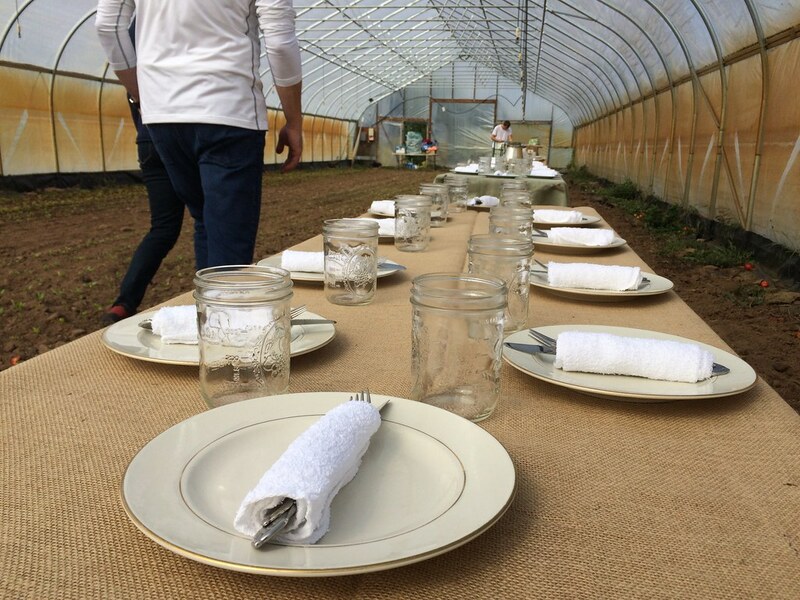 The "One Mile Meal" dinner was held at 3 p.m. at Round Right Farm (145 Dream Field Lane, Terra Alta, West Virginia). It was bring your own beverage (and cup) and bring your own chair. 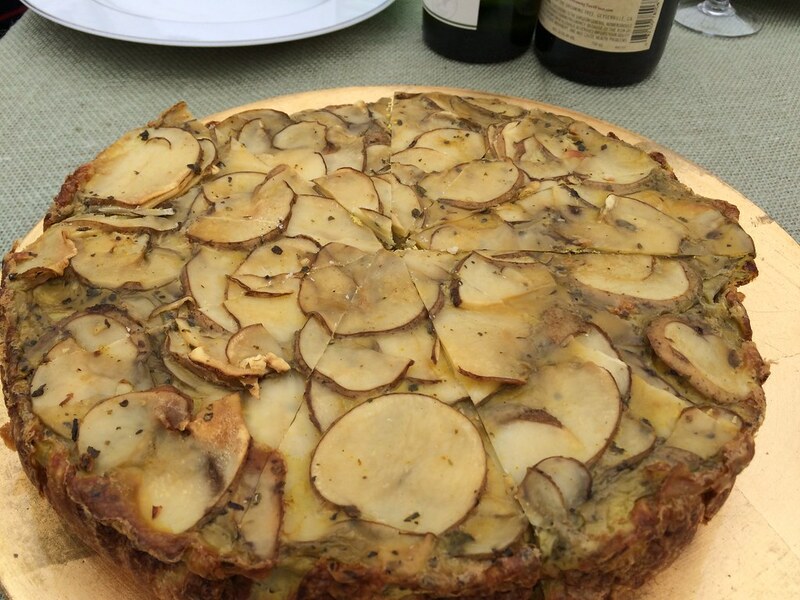 The dinner was prepared using only ingredients grown on the farm within one square mile. 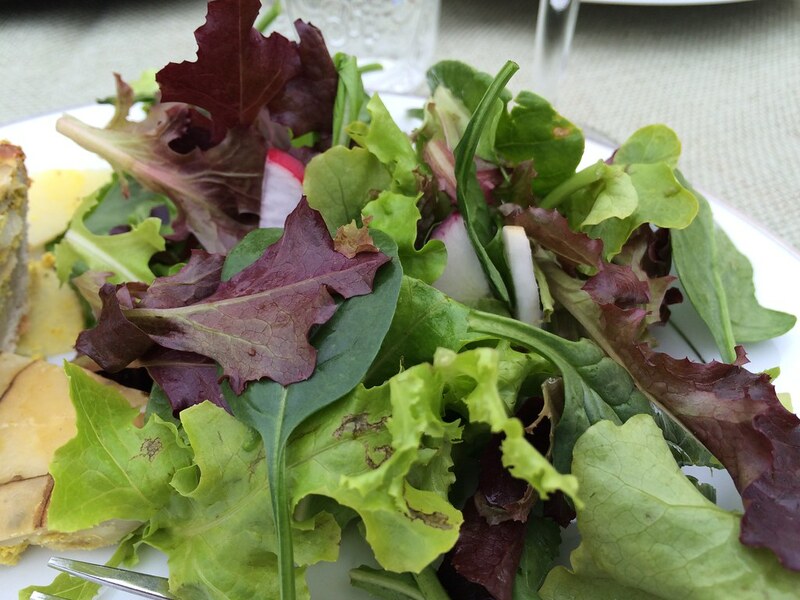 Come enjoy an al fresco Dinner at Round Right Farm. 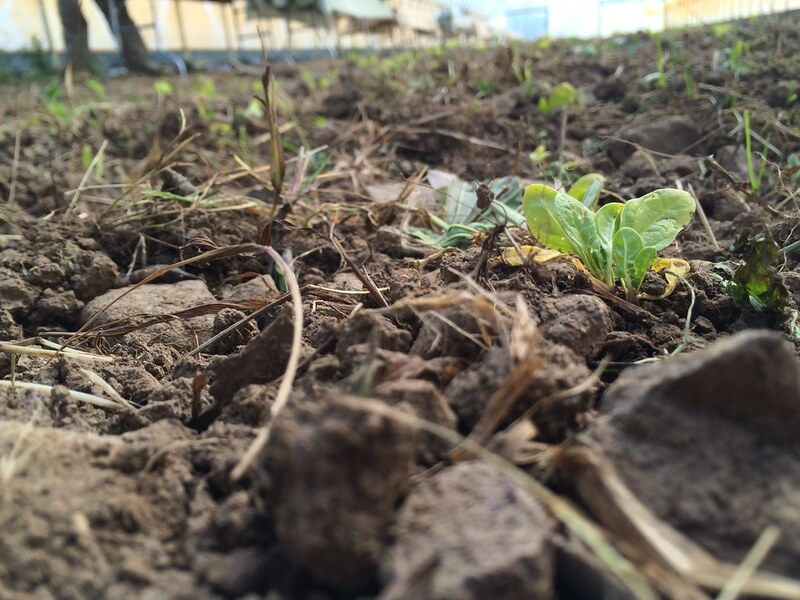 The Dinner will be prepared using only ingredients grown on the farm. 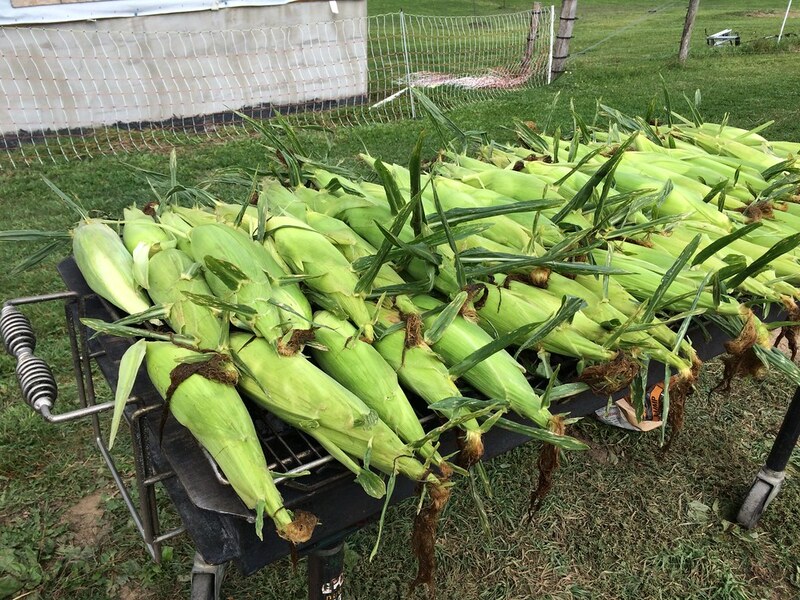 The menu will be created the weekend of the event based on what is ready for harvest. 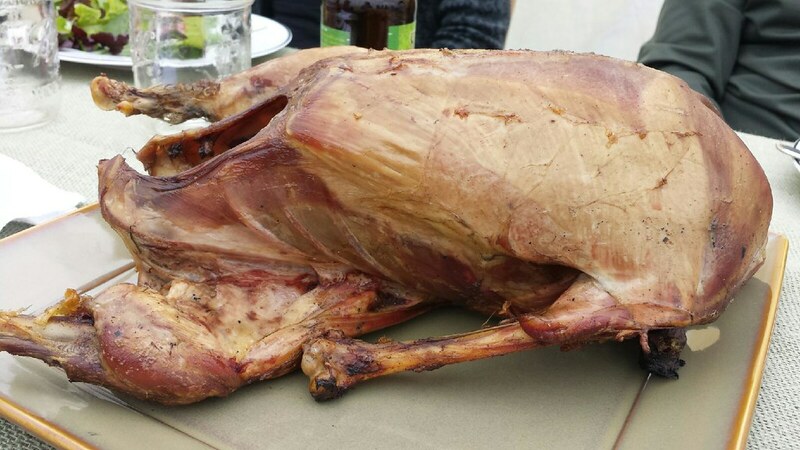 We do know that asparagus-fed smoked goose will be featured for the carnivores, along with a variety of vegetarian and vegan dishes. We will provide all plates, flatware, napkins, linens, tables, etc; however, if you BYOB you will need to provide your own glass. We would suggest crisp white wines, ales on the hoppier side, and clear liquors such as gin, cachaca, or moonshine as accompaniments. Entertainment will be provided by Mother Nature as we watch the full harvest moon rise, followed by a full lunar eclipse for those who wish to stay a little later. The Dinner is reservation only, $35 per person, not including tax and gratuity; payment may be made by cash, check, or credit card at the event. Reservations can be made by email at chefmarion@yahoo.com or by private message on this facebook page. After a beautiful, winding drive through the hills of Preston County, we arrived at Round Right Farm. We were early, so we took a small tour of the farm, which seems to span for miles. 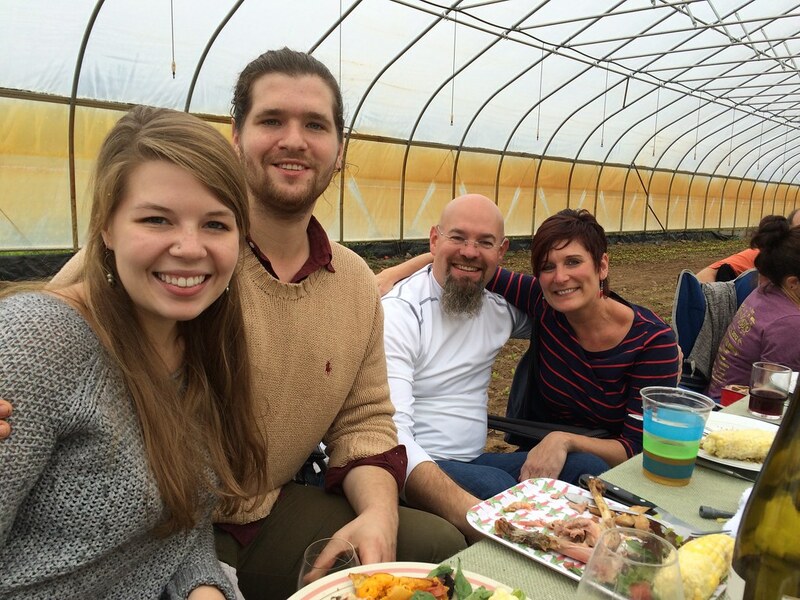 Due to some pretty fierce wind and the threat of rain, the dinner was held in a high tunnel next to rows of veggies. Tables were lined with burlap, mason jars dotted the tops and a mish-mash of chairs were arranged on each side. 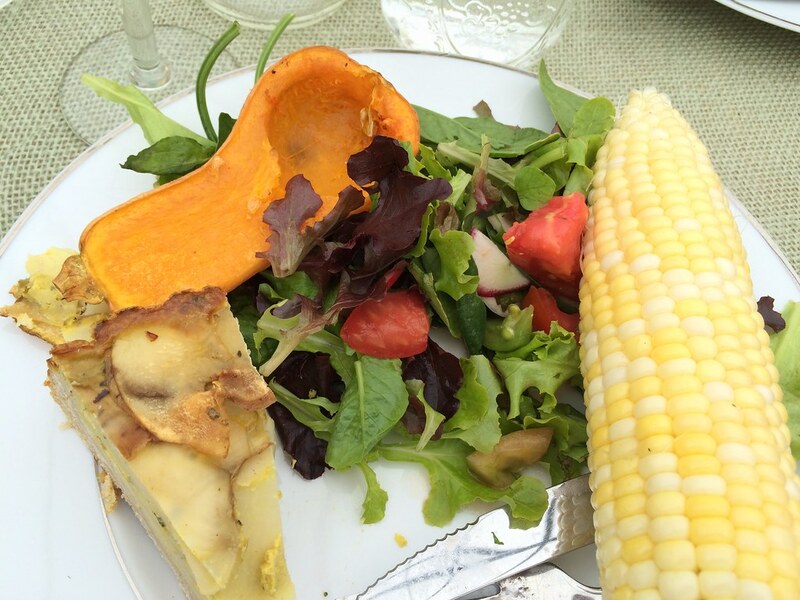 The menu featured goose, greens with an apple cider dressing, balsamic eggplant, a potato quiche, roasted root vegetables, roasted butternut squash, corn on the cob and a squash, apple and maple syrup dessert. Everything was served family-style with various members from our table going up to collect dishes to then bring back for everyone. At times, it was hectic, but fortunately, it was a fun time with good people. 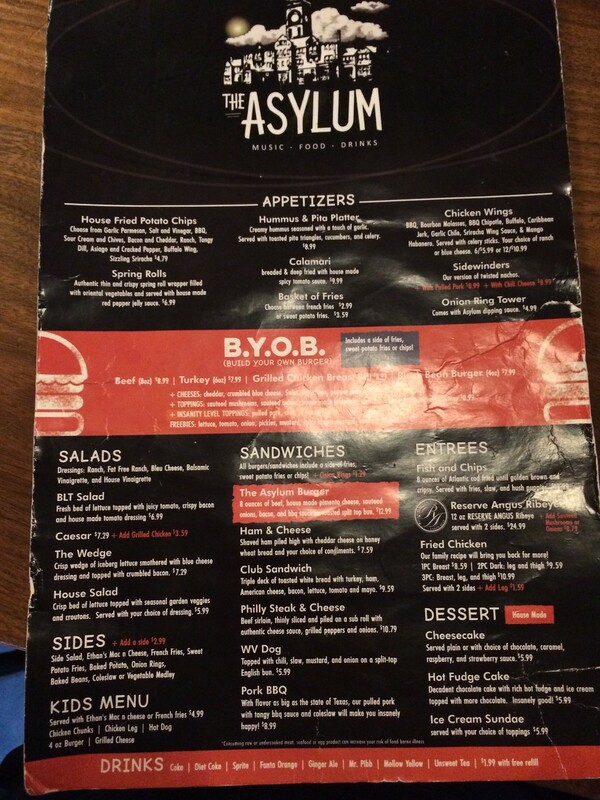 The Asylum is a new addition to my Lewisburg to-visit list, as it just opened in 2014. I penciled it in for dinner on my second night in town. The Asylum is located just back off the main street at 114 East Randolph St. I'm not totally sure the background on the name or theme, but the interior is pretty nice. 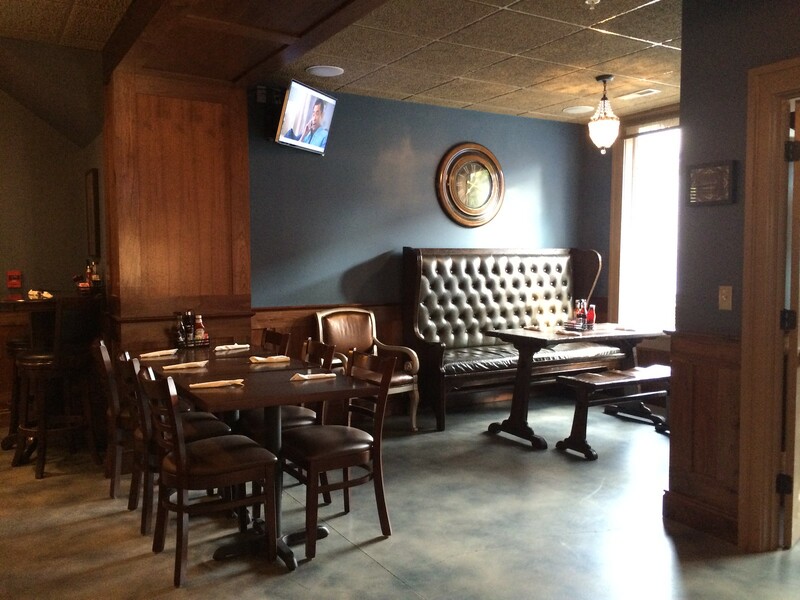 Tall, tufted benches and dark wooden tables and tall round high tables. Some dark blue accent walls. A few TVs are placed around the dining area with some comfy seating, too. My coworker Jayne and I sat at the bar and looked over the menus. They also have a fairly extensive craft beer and spirit menu. Jayne is a bit (lot) more discerning about the food she eats, so her decision was pretty simple - black bean burger. I took a bit more time. They offer typical fried appetizers: basket of fries, calamari, house-fried potato chips, spring rolls and their version of twisted nachos, sidewinders. There were a few salads; a build-your-own-burger section; sandwiches like a club, ham and cheese, West Virginia hot dog, and Philly steak and cheese; and entrees like fish and chips, Angus ribeye and fried chicken. I landed on their namesake burger: 8 oz. 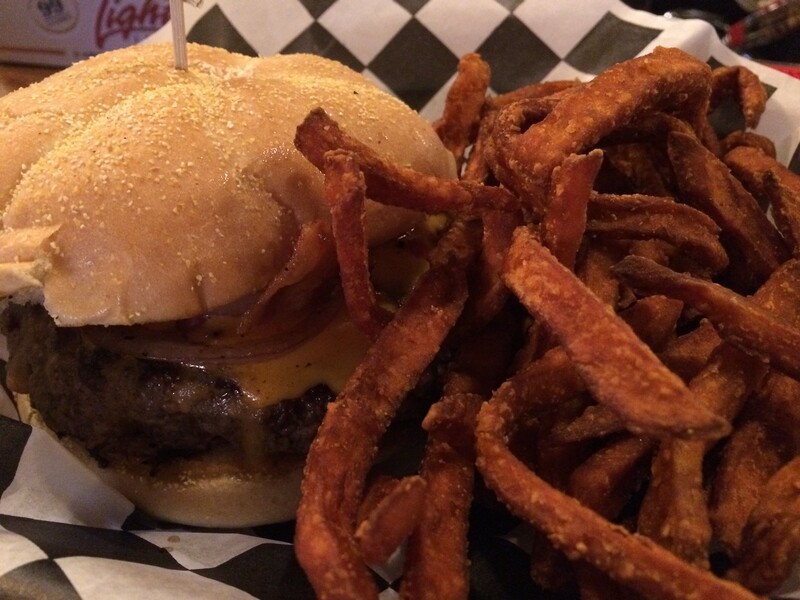 of beef, house-made pimento cheese, sauteed onions, bacon and bbq sauce on toasted split top bun. 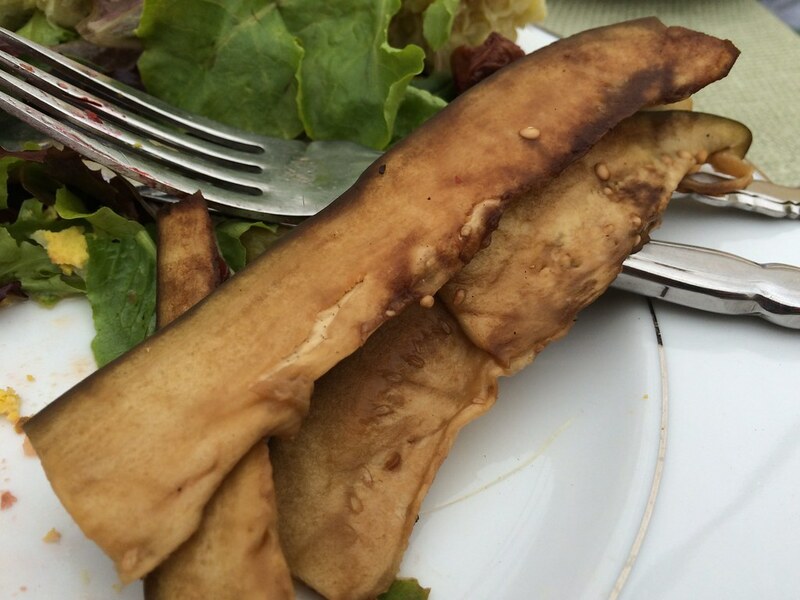 With sweet potato fries. The burger was pretty good, but it was pretty greasy, too. I was really hoping to taste more of the pimento cheese (because mmm), but I didn't get much. Bacon could have been crisper to give some texture variance. Sweet potato fries were tasty. Overall, pretty average. I didn't dislike it, but I think there are other places in Lewisburg I would go first if given the option. Any dinner can be made better by dessert. That's my theory. At least for this blog post, anyway. After dinner in Lewisburg for my first night, I scoped out ice cream shops nearby. 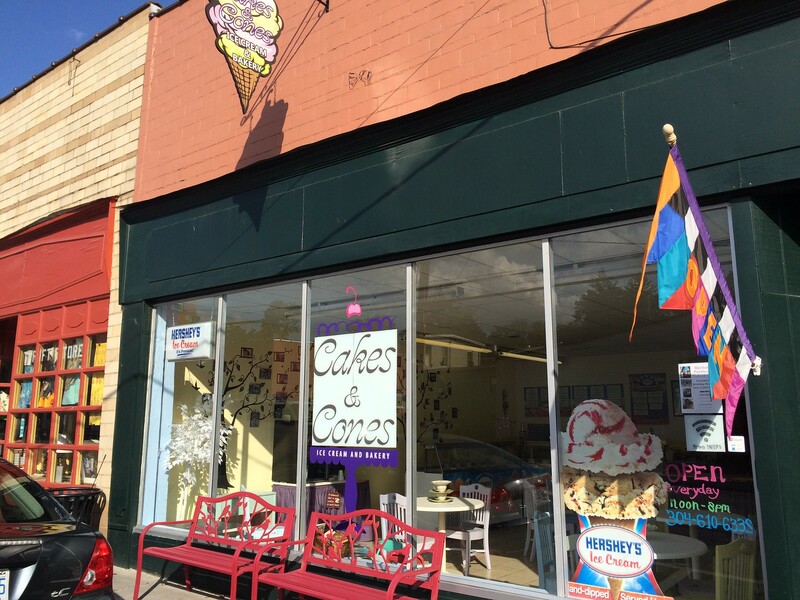 The first that popped up was Cakes and Cones Ice Cream and Bakery (doesn't it seem like it should be reversed? Cakes and Cones Bakery and Ice Cream. 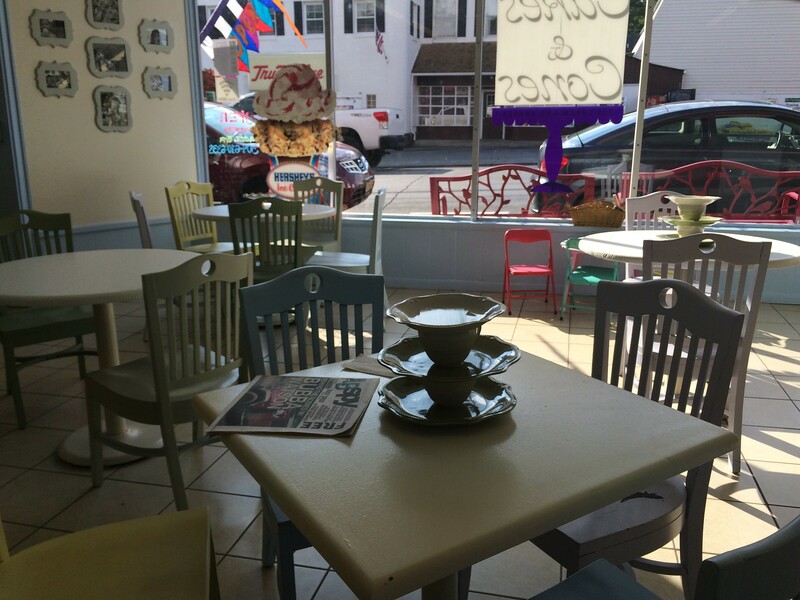 Or Cones and Cakes Ice Cream and Bakery?). It is located in downtown Lewisburg, so I made my way there. 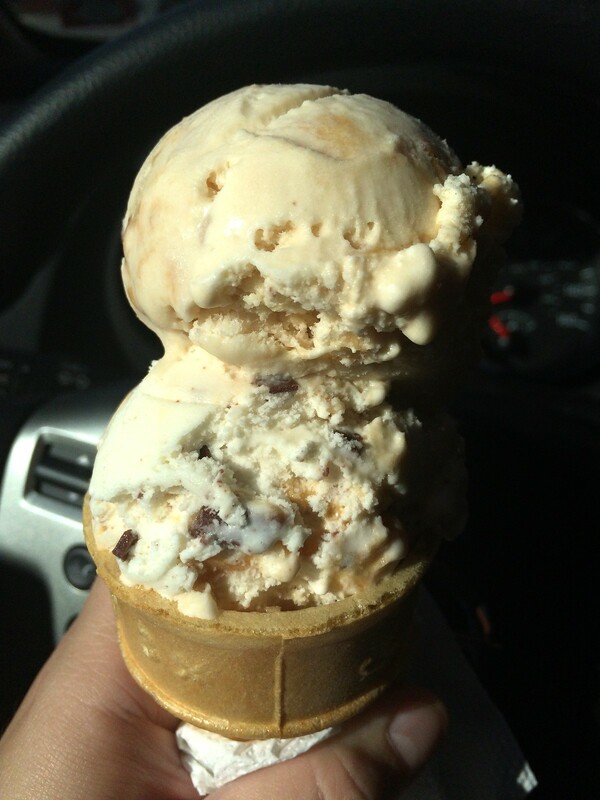 Two scoops in a cone, and I was on my way. 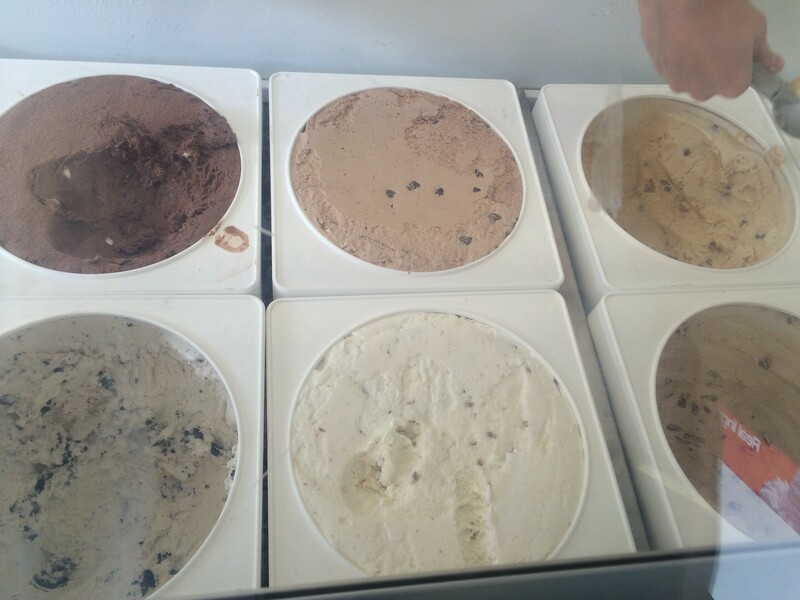 The ice cream had a super sweet candy taste. Sugar overload. Lots of crunchy pieces of candy in the middle. But was it good? Of course. But it's also straight form Hershey's and not produced on site. So, it's kinda hard to judge based on that. The service was just a bit off, but the atmosphere in here seems totally cute, and I think I'd go back on another day to check it out. 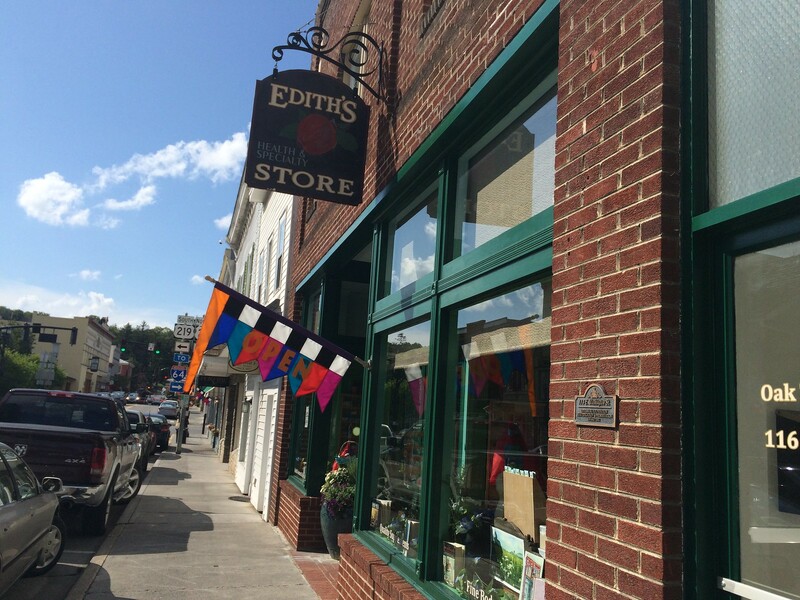 When in Lewisburg recently, I stopped in Edith's Health and Specialty Store. I just thought it was so neat right in the center of Lewisburg to have these specialty items. 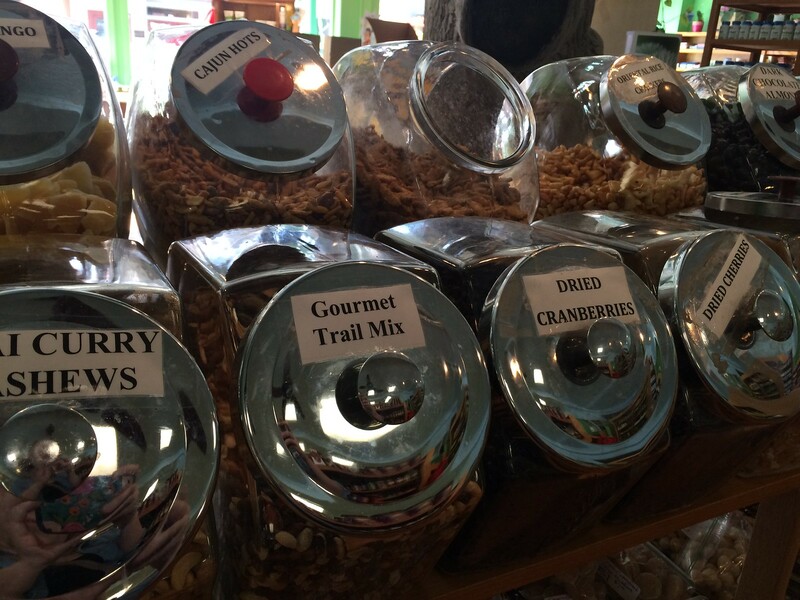 They even have canisters with dried fruit or other snacks. Have you been? 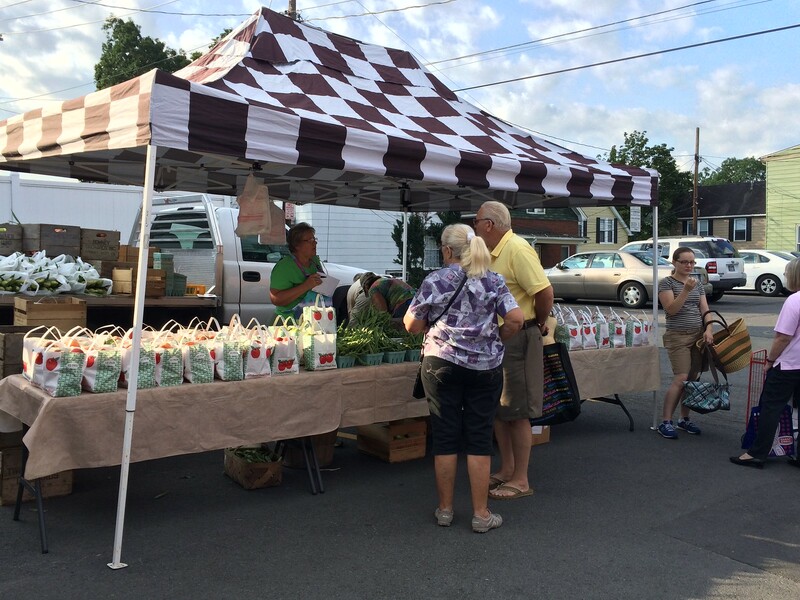 I always get excited when Lee Farms shows up to the Morgantown Farmers Market. And judging by the line that quickly wraps around their booth, I'd wager others are excited, too. 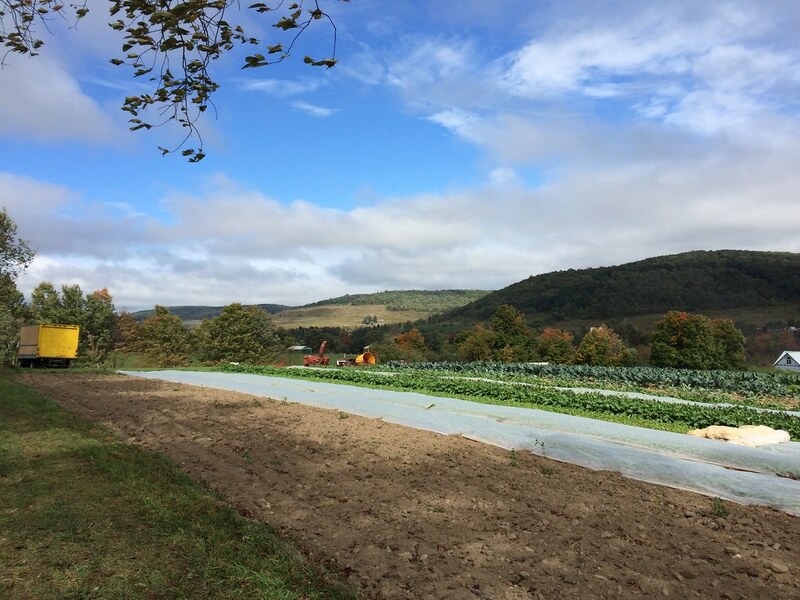 The Fairmont farm grows vegetables and has an orchard of 350 trees that produce several varieties of apples, peaches, plums, and pears, as well as concord grapes. 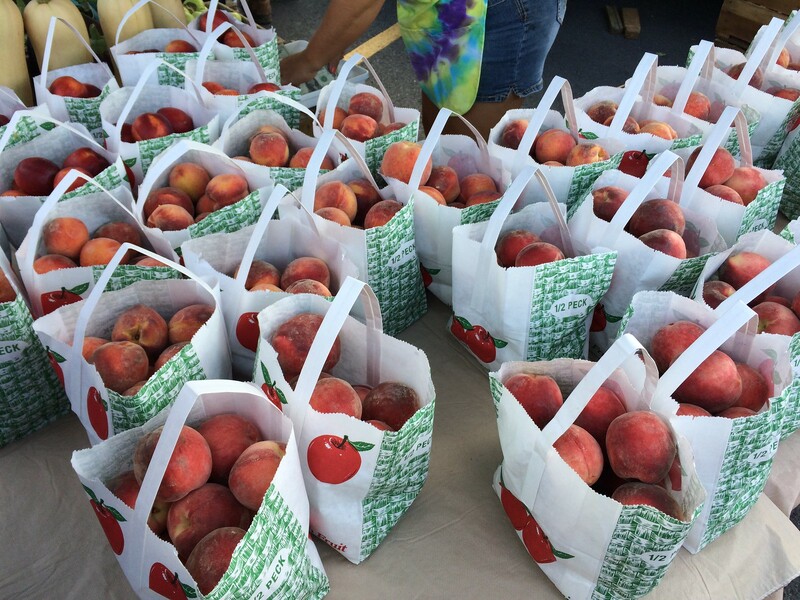 I recently purchased a half peck of nectarines and a half peck of summer rambo apples. 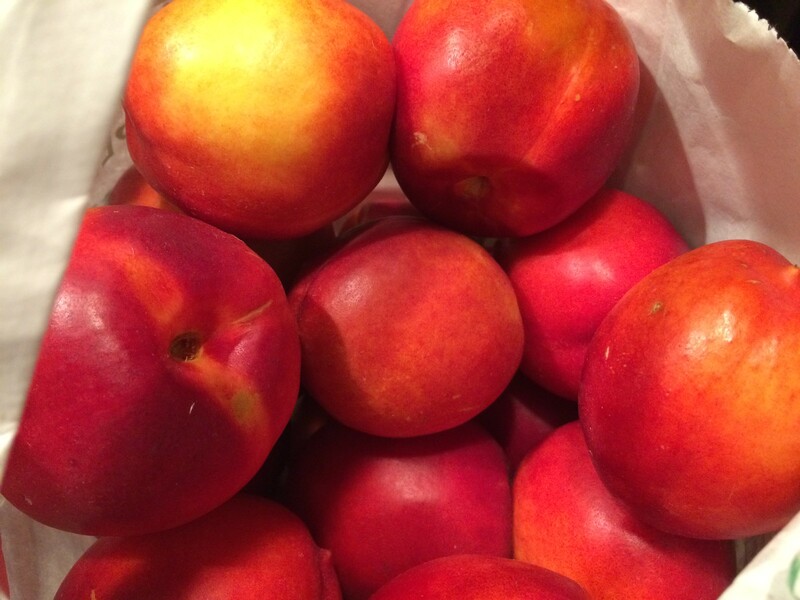 These nectarines were perfect for a quick snack of part of my lunches. 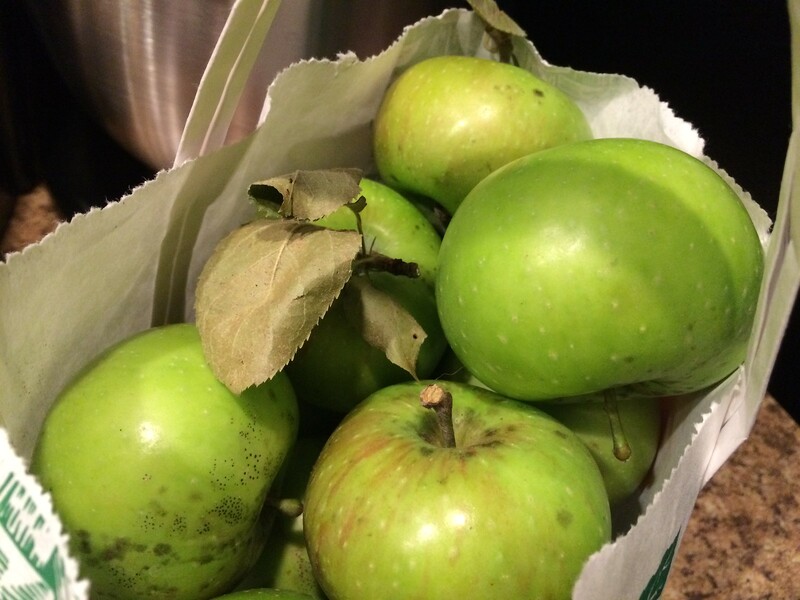 And the apples? They looked beautiful sitting on my counter for a bit until I used them to create a crisp. So tasty! 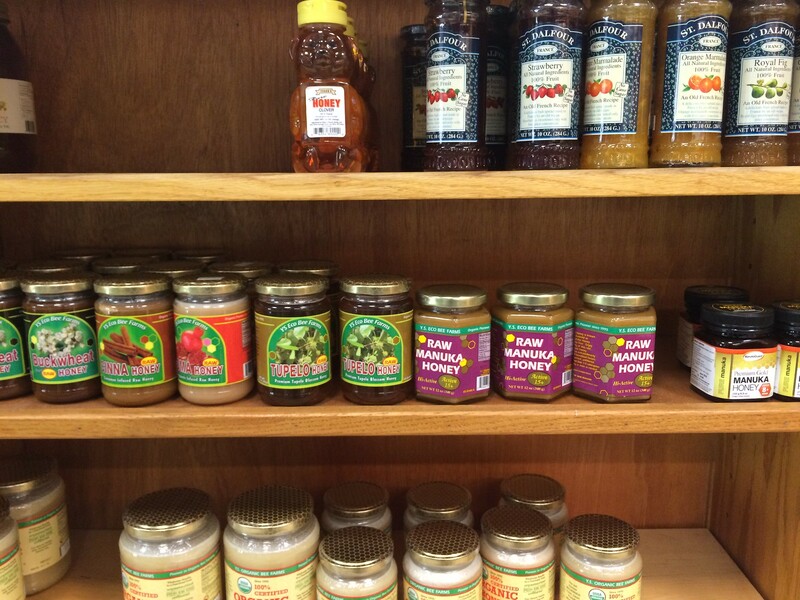 What are your favorite items from Lee Farms? You wake up from a deep slumber at the General Lewis Inn. The lifted queen bed was a perfect firm - but not too firm - that had just a bit of give to facilitate level 10 coziness. Birds are chirping, and the morning sun is quickly rising, filling your room with light. After a quick shower and selection of today's outfit, you grab your room key (attached to a metal room number) and race down the stairs. You begin the descent down the hill into downtown Lewisburg past antique shops, lunch spots that will open later in the day and local businesses. Small shops are just opening, erecting flags outside the front door. You turn the corner to see The Bakery already booming with a crowd. 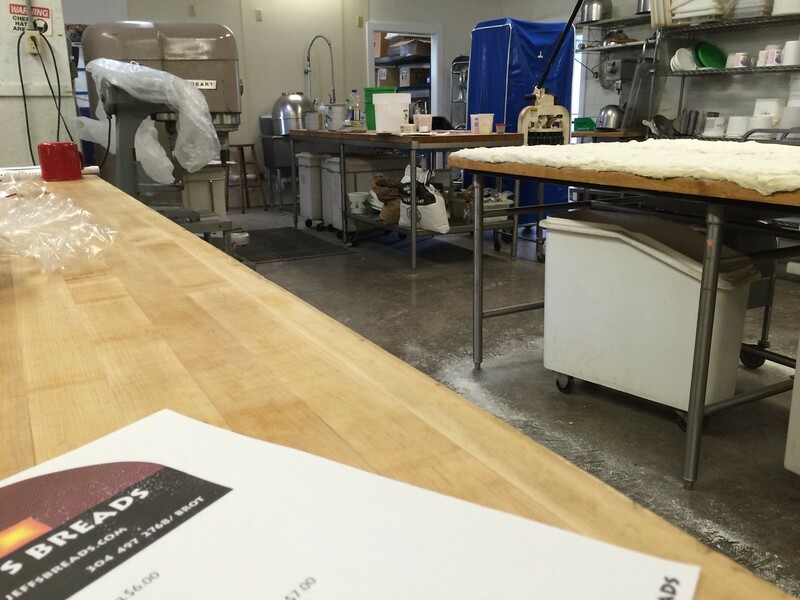 Customers are shuffling in and out of the door, wafting smells of fresh-baked bread with them. 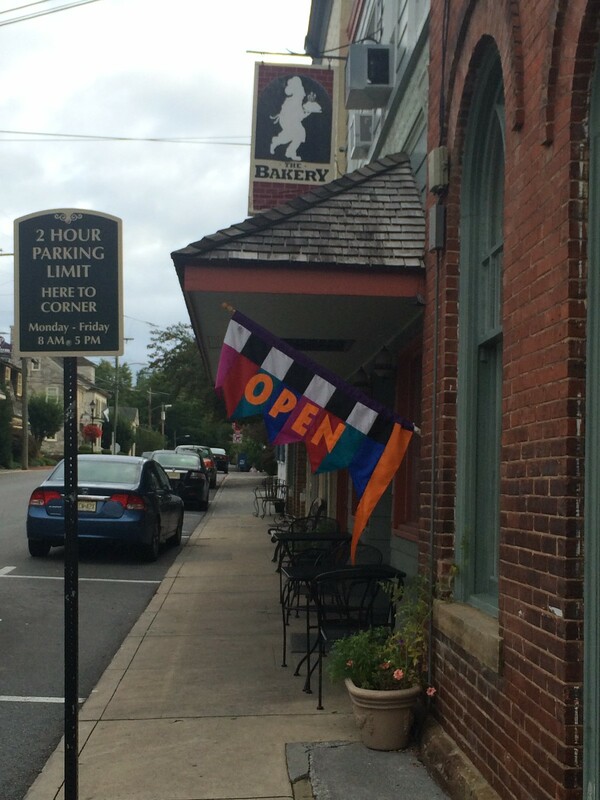 You're excited to finally get to The Bakery, because when you're in Lewisburg, it's usually in the evenings. This time, though, you finally get to try the tasty bagels and pastries you've heard people rave about. 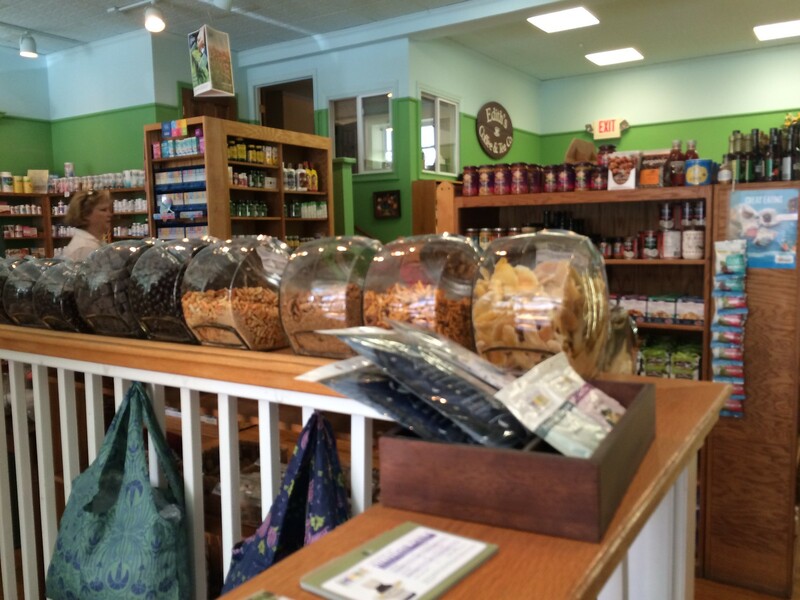 Once you finally get to the counter, you quickly look over the offerings. There's biscotti. There are some cookies and other sweets. 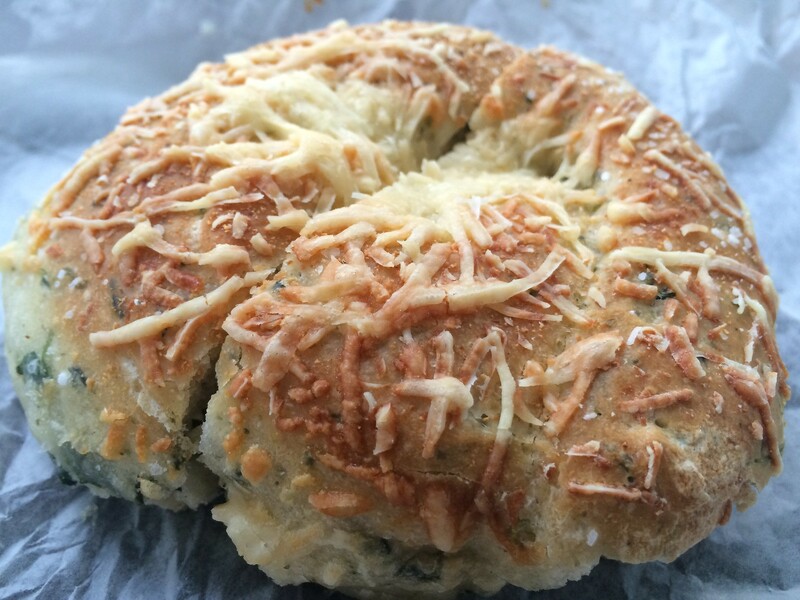 You inquire about what bagels they have today; stopping at the spinach and parmesan bagels, which are warm out of the oven. "Do you want that with cream cheese?" the lady behind the counter inquires. "Absolutely," you respond. Clutching the warm, wrapped treat in your hand, you climb the hill back up to the General Lewis and claim a rocking chair on the front porch. You peel back the layers of white paper to reveal this golden nugget of a breakfast. The bagel - It's airy. It's light. It's crumbly and flavorful. It's not dense or hard, like most other bagels. It's more of a biscuit, maybe. The ever so slightly sweet flavor of spinach with a creamy cheese and golden browned bagel was delicious. Truly, delicious.